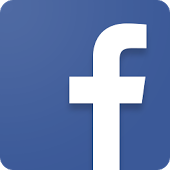 Welcome to the Marque Sports Car Association of South Australia. Please note - the information session for the 6 Hour Relay will be on Monday the 29th of April, not the 22nd (Easter Monday) as previously advised. 6 Hour team managers - please email the entry form B to Sue. Supp regs for the 2019 Peter Hall Memorial 6 Hour Relay are now available on this site. 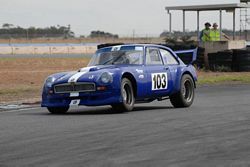 Note to all competitors - in the CAMS Event Entry System, under the "My Cars" section, please record your Dorian number (in the Transponder field), your fastest lap time for Mallala (in the Lap or Regularity Times section), and your correct car class in the "SA Super Sprint Championship" field (allowing for forced induction if applicable). This will make it easier for correct timing to occur at the events. 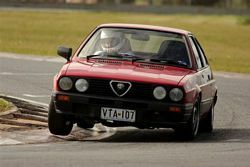 Track waiver forms - Mallala Motorsport Park require that all drivers & officials complete and sign a waiver form at each event. This is quite a bottleneck at sign-in, so it would be appreciated if all entrants can download, complete and sign a copy of the waiver form, available on the Supp Regs page. Please bring the completed form to sign-in. Note that there are seperate forms for entrants under 18. As we use your "fastest time" to determine your grid position, please ensure this time is put into the notes section on the meecams system. Please also enter your car number, and indicate if you are sharing a car with another driver (and who that driver is) in the notes section. MSCASA uses Dorian transponders to obtain accurate lap times. Each driver requires their own Dorian, and these can be purchased by ringing Sue on 0408 858 046 and paying the cost, currently $430.00 for MSCA members and $450.00 for non MSCA members. We will give new drivers one event grace. Round 5 2018. Phil is happy for anyone to use the low-res photos at the above link for no charge, provided the watermark remains on the photo and appropriate attribution is included - ie "Photos by Phil Radoslovich"
High resolution copies of these photos can be purchased from Phil using the above email address. 1. Please nominate your fastest lap time on your entry before posting (meecamsau entries put your time in the notes section). 2. MSCA will then allocate you to a group, (with group 1 being the fastest cars), and a grid position within that group. Group and grid positions are determined by your nominated time, and if you are sharing a car. 3. Depending on the number of entries, there will be 4 to 6 groups. 4. The driver will, for the day, remain in his / her nominated group and grid number, unless there is a speed disparity that requires a change. 5. For cars that are double entered, both drivers will be allocated to groups that will allow time for car number and Dorian change over. 6. For cars that are double entered, with one driver being a newcomer, the newcomer will be given an ontrack session to establish a time. This session will be run immediately after the new drivers briefing. 7. There is no practice session for experienced drivers. If a car has had mechanical changes, they can request a safety session to test / bed in brakes etc. This request should be made on the entry form, or in the notes section for meecamsau.com entries. 8. You will get 4 runs of 5 laps each. There will be a lunch break to allow officials and flag marshalls to eat and have a rest. Should there be delays during the day and the fourth run has not started by 3:00pm, it will not be counted as an official run. 10. Check the MSCA website 2 to 3 days prior to the event to get your group and grid number. This will also give you the opportunity to ensure that your entry has been received. 11. The annual scoring system will continue to be based on the competitor's best four events for the year. He/she must complete all available official laps at each of those four events to be eligible for annual trophies. 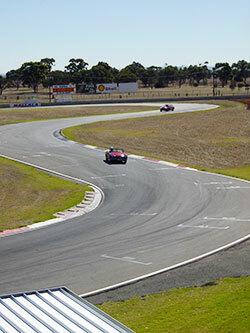 The M.S.C.A was formed in the early 70's to give the smaller Sports Car Clubs of South Australia the opportunity to compete at the Mallala Motorsport Racing Circuit and in Motorkhanas and Hillclimbs. With only a low number of members competing from each club, the individual members joined the M.S.C.A., allowing those drivers to compete in their cars. The Marque Sports Car Association is an association of 16 Clubs with the CAMS affiliation fee being paid by the MSCA, and the individual Clubs paying the M.S.C.A. an annual subscription fee. Since its inception we have grown from 3 cars on the track with no passing to now up to 18 cars on the starting grid, starting in pairs flagged off 5 seconds apart, with 5 flying laps and passing allowed on the straights only. We now run all super sprints using the Dorian Timer System which has taken over from the computerised timing system and hand held stopwatches which we used to use. Full safety systems are in place for every Super Sprint with an Ambulance, Fire & Rescue, Course Car, Recovery Team and manned Flag Bunkers with trained Officials. A maximum of 120 entries for each Sprint are accepted, with all cars being Scrutineered before entering the track. Classes range from standard road cars to full race cars. Grids are made up from your nominated fastest times on your entry form, with these grid positions being available 2 - 3 days prior to each sprint on our website. You get at least 3 runs of 5 laps to Sprint around the track. 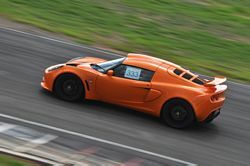 Sprints are an ideal way to learn car control for every day driving with the Super Sprint Series run over 12 months with 5 rounds and a 6 hour Modern Regularity Relay. We also have a Driver Training Day run by our more experienced drivers showing you car control exercise such as braking into corner, driving to avoid obstacles on the road and cadence braking. A Club Display Day is held a the beginning of the year which incorporates the trophy presentation from the previous year. Costs are kept to a minimum. The licence required is a CAMS Level 2S which is currently $125.00 per year, plus membership of M.S.C.A. which is currently $25.00 per year. Note that to join MSCA you must be a member of an affiliated Club, as listed below. Austin Healey Owners Club of S.A.